(Note: This article is a translation of an article that appeared in the Greek newspaper, Proto Thema on 04/06/2017. Original article and photos are from the site, and it has been translated into English because we think it is of high-value and will be of interest to those gourmet chefs and cooks interested in the use of saffron in general, and especially Greek saffron. Original article written by Δανάη Δασοπούλου – Danae Dasopoulou. For any translation issues, please contact us at [email protected]). How the red gold of Greek soils started “speaking” Italian, who is the “Emperor” of Krokos that made this awesome spice known in Italy, and why risotto alla milanese is… the mother-in-law’s dish? Its color distinctive, its aroma surprising and its taste exciting… We’re talking about the gold of Greek soil, the ζαφορά (zafora) as it is also known in Greece, the saffron, the crocus sativus, or simply the krokos, which is regarded as one of the most precious spices with a history that reaches ancient times. Although krokos is inseparable from Kozani, where it is being organically cultivated, a Greek businessman managed to introduce Greek saffron in the demanding Italian market so that the Italian dishes acquire the unique golden-yellow color that 2-3 filaments of this special plant generously provide. 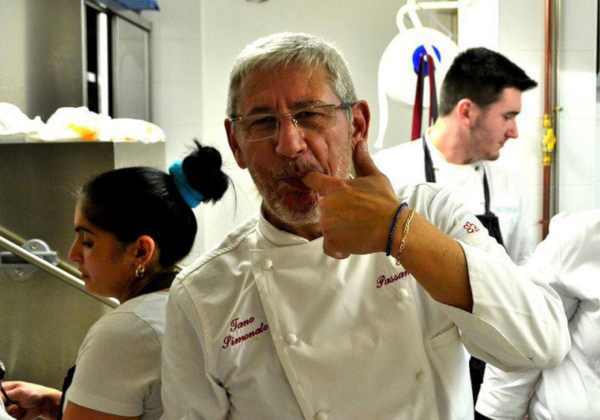 George Mpakagias describes the difficulties, but the success also that krokos Kozanis faced which lead to the amazing result of krokos Kozanis featuring in many dishes of at least 100 exquisite Italian restaurants. Claudio Sadler, Chef awarded with 2 Michelin Stars. Krokos, this delicate flower with the purple petals and the distinctive red filaments, conquered the Ancient Greeks. Homer refers to it in his Iliad when describing the colour of the dawn of the day. You can find krokos though being mentioned in writings of Sophocles, Aischylos, Aristophanes, even Pindarus, while Hippocrates praises its medicinal benefits. At the same time, saffron could not be missing from Greek Mythology also, as it is said that Hermes, while practicing the discus throw, mortally wounded his friend Krokos. Shocked by his fatal mistake, he gifted Krokos with immortality by transforming his dead body into a purple flower and his blood in red filaments in the heart of the flower. Nevertheless, the references are not limited to Greece, but travel to Egypt also with words written about Kleopatra enjoying her bath with saffron. Its reputation reaches ancient Rome as well, as its precious ‘threads’ were added in wine, while in Byzantium the imperial garments were being colored with it. Regarding Kroko’s origin, the opinions differ, having many on one side placing its “birth” in the East, and others claiming that it was first cultivated in Greece during the Μiddle Minoan period. 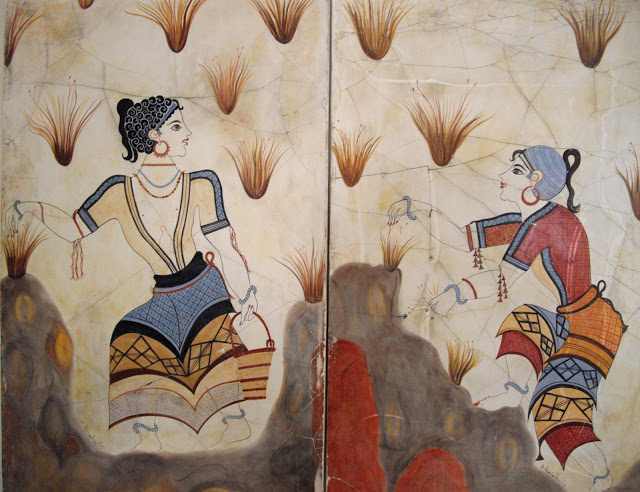 Wall paintings of the era, found at the Palace of Knossos, seems to reinforce this version as it represents women figures collecting krokos flowers. Its history is long, its properties are many, its value is priceless. Saffron, named after the Arabic word zafaran which means yellow, covers with its purple carpet the “Krokovillages” of Kozani since the 17th century, the time when modern culture started in Greece and gives to the place unique beauty. The veil that covers the land of the territory seems like the dress of a fairy that chose Kozani to rest. The little fragile cones that evolve from each stem every October, hide inside them the orange-red gold, forming a fine bouquet full of grace and nobility. Collecting the “treasure” is a very difficult mission. Thousands of people work on this demanding task, as time is the worse enemy for krokos. If the krokos collectors do not manage to gather it within a few hours after its blooming, there is danger for krokos to wither away and its filaments destroyed. For this reason, whole families are recruited to fight with time working from dawn until sunset, so that the Krokos (Crocus) flowers are transferred on time and the extraction of the filaments starts, which will give the unique and premium quality krokos, to Greece and to the whole world as well. 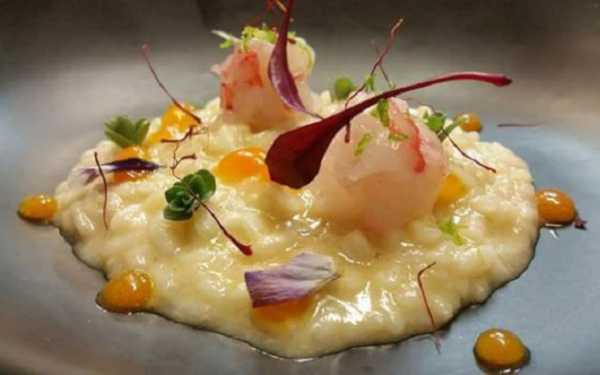 Among the countries that krokos filaments travel to is Italy, with a cuisine that hosts many dishes using saffron, with risotto milanese being the most famous. 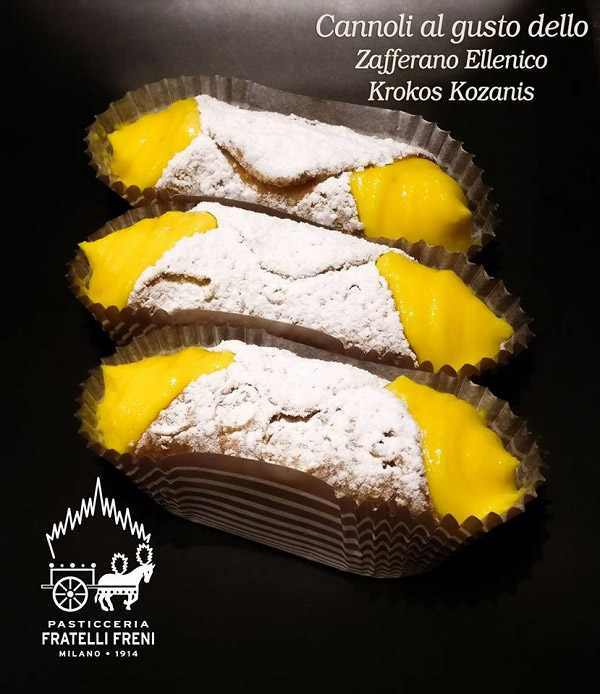 Despite the local production in Sardenia, Toscane, Abruzzo, Umbria and Marche, during the last year restaurants that have won Michelin stars, famous chefs and luxurious hotels include in their menus the Greek Krokos Kozanis, leaving aside the Italian saffron. Who is behind this important turn? George Mpakagias. A persevering businessman, who believes deeply in the value of Greek saffron and has set as a life goal to make Krokos Kozanis famous in Italy and the whole of Europe as well. Mr Mpakagias explains that his occupation with the product started a while before the EXPO Milano exhibition 2016 with the main subject of gastronomy when he decided to support the Greek kiosk with quality Greek products. As he says, he came in contact with the best greek companies and one of the first that replied to him was The Cooperative of Saffron in Kozani, which was established in 1971 and has the exclusive right of collecting, packaging and distributing Krokos Kozanis. “Some years passed by, Nikos Patsouras became the new chairman, a brilliant person. Through The European Economic Community, he managed to acquire PDO certification (Protected Denomination of Origin), ISO 9001 (International Organization for Standardization), while he started the organic production. That is what it makes the big difference between krokos Kozanis and the rest of the products,” Mr Mpakagias mentions. As he mentions, basic condition for krokos Kozanis quality is the quality of the bulb, the way it is collected, sorted and maintained. The Cooperative strictly complies with the specifications that have been set by the ISO, in contrast with the rest of the saffron producers that “do not because of the cost.” Moreover, the characteristics that are required for certification have to do with the color, aroma and taste, are of very high quality and exceed the quality specifications set by ISO, according to analysis conducted several times over the past several years. As for the yearly production, Mr Mpakagias explains that the world market is moving around 210 tons, from which 190 are produced in Iran. The second place country in production is Greece with about 4.5 tons, third is Maroco and then India. 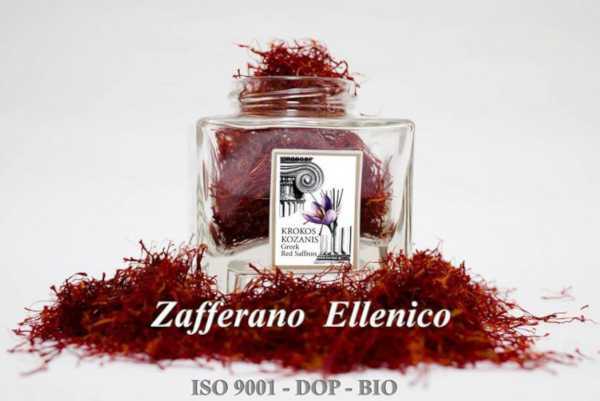 The businessman notes that 250.000 filaments are required to produce 1 kg of saffron. “In Italy we have: 90 kgrs in Sardinia, 3 kgrs in Aquila, 1400 grams in Lombardy and 300 grams in Tuscany. All that hardly sum up to 100 kgs. On the other hand, according to the Italian Union of Saffron Producers, the consumption reaches the 22.5 tons,” Mr. Mpakagias says and opens the chapter of adulteration for powder saffron. “The import in Italy does not overcome the 4 tons. But the consumption is 22.5 tons. So what do they put in there? Sandalwood powder for the color, powder of animal bones, even gypsum they add because it absorbs perfectly the color and aroma. 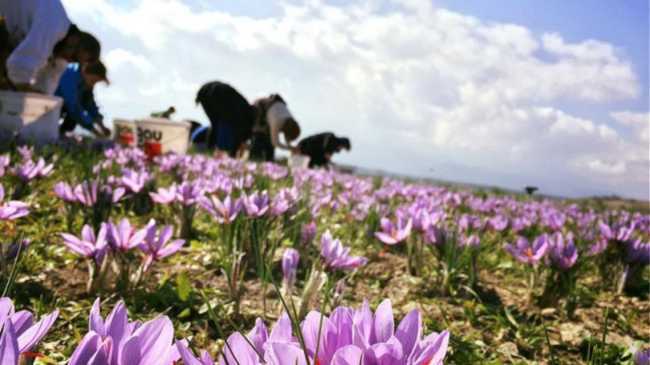 According to the Italian Union of Saffron Producers, 85% of the consumption is not saffron!”, he notes and mentions two characteristic incidents with Italians being amazed while tasting krokos Kozanis as they realized that all these years… they were not eating saffron. “At Milano EXPO there were samples for tasting. A lady came and told me that what she tasted did not have the taste of saffron or zafferano as they call it in Italy. 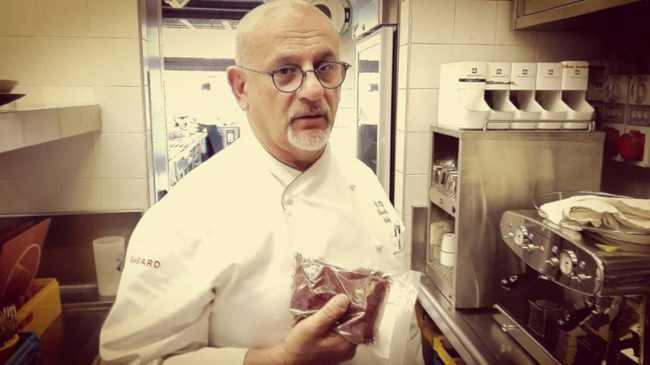 It is normal: she had never eaten real saffron,” Mr. Mpakagias says and goes on describing all that he talked about with the tiptop Italian chef Mr. Gualtiero Marchesi of the famous restaurant «Il Marchesino» at the Milano Scala, which was awarded three Michelin stars – that the unconventional chef later decided to reject. “The King of Italian culinary arts was named Marchesi, who began the revolution in Italian gastronomy and created exquisite cuisine. 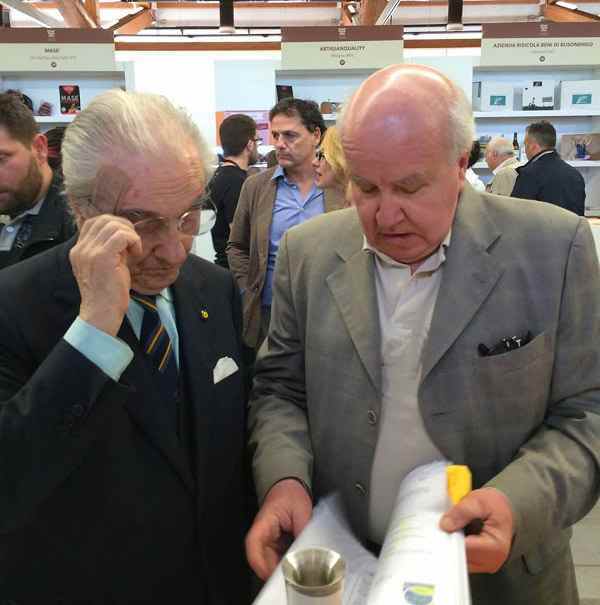 During an exhibition in 2016 the famous restaurant critic Davide Paolini and Marchesi approached me. Paolini told Marchesi that I have the best saffron of the world. Marchesi looked at me and answered that he does not know about it. I told him in a teasing mood, ’With all respect, you are the patriarch of Italian chefs, but, I’m the King of saffron. If you don’t know Greek saffron, that means in whole your life you never used real saffron’. Since then we became friends,” says Mr. Mpakagias and smiles large when he remembers that Davide Paolini after this incident dedicated one of his books to “The King Of Saffron”. Krokos Kozanis, beyond its unique taste and exquisite aroma, is also well known for its antioxidant, anti-inflammatory and vascular health, containing vitamin A, a-b carotene, vitamin B, B2, C, and Folate, and in Greece a large percentage of saffron is organically cultivated, but this information is not widely known. “We represent today around 95% of the organic saffron production of the world. Us Greeks are the only producers of organic saffron and we don’t know it. We have the monopoly on organic saffron. What we mean by organic saffron is that the field must have certification for organic production and the quantity produced from that field must have organic certification as a product also,” Mr. Mpakagias says noting that although the product is exquisite the problem that is faced has to do with marketing. Indicative of that fact is that Greek chefs only recently started using krokos Kozanis in their menus, as up until now, they preferred the Italian zafferano. Who chooses, though, to use saffron in Italy beyond the great chefs and the Michelin awarded restaurants? “The mothers-in-law,” says Mr. Mpakagias in a disarming way. “The classic dish is risotto alla milanese. Is it an easy dish? No. Who prepares it? The mother in law. For the rice to be ready it needs work, it needs 21 minutes of stirring. Which young lady will spend 21 minutes for stirring? None. The mother in law though that wants to win her son in law’s favor will prepare it on Sunday. It’s Sunday’s classic. Therefore the consumption is on the restaurants and the mothers-in-law”, he adds and in a narrator mood, he describes how the legendary risotto alla milanese was born. “When they were building the Cathedral of Milan, they used the saffron to paint the stained glass. When they made a break, they had rice to eat. One of the artists accidentally threw saffron in the rice. He tried it, he liked it and then the risotto ala milanese was born. From an accident, the risotto ala milanese became the traditional dish of the Milanese,” he explains. The Italian market, however, does not seem to be the easiest one for someone who dares to reveal that the zafferano consumed is less than Greek krokos. So what were the ways that Mr. Mpakagias had at his disposal? Either to address, as he says, the large supermarket chains by spending many thousands of euros on advertising, considering that he should open a front with another product that is not a saffron, or put the bar high up and turn to the top chefs. The daring businessman chose the hardest road and set up a network of contacts with the best chefs in Italy. Result? Krokos Kozanis was in a few months in about 100 menus of award-winning restaurants, many of which have Michelin stars, from Lombardy and Turin, to Rome, Naples, and Venice. “The chefs are happy. They had patience and perseverance of course, as it is one thing to have a kg of saffron from other merchants and another 100 grams of Greek krokos. The point, though, is that they understood what we are doing. I convinced them of our philosophy,” he says. 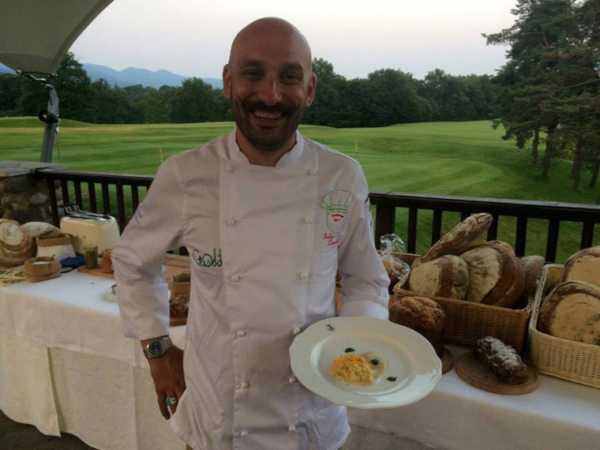 It is no coincidence that Bergamo’s Albenza Golf Club, one of the top ten in the world, invited award-winning chefs to a special event to play golf and then prepare unique tasting Kozani saffron dishes. 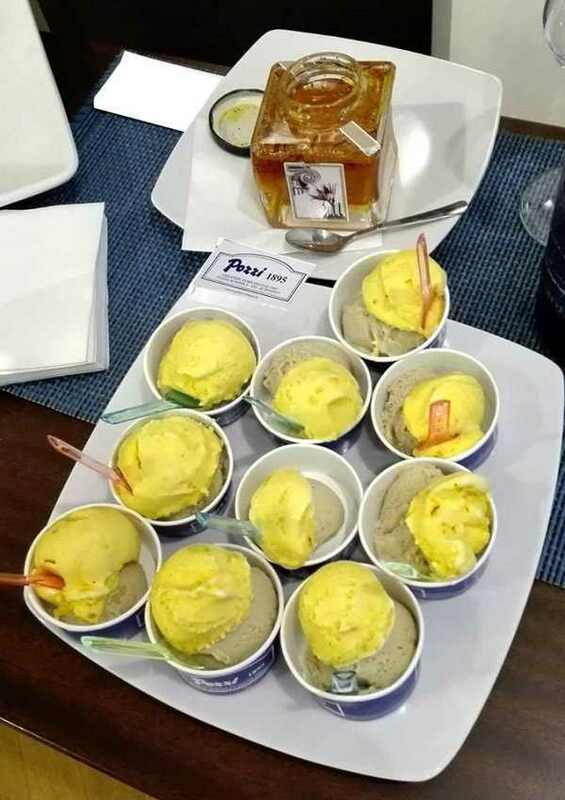 “The next goal is the confectionery market, while ice cream with saffron with its delicate flavor has already brought excitement to the famous Italian gelaterias. Along with this market, there is also the beverage market. We started working with Milan’s historical drink, Fernet Branca. Until recently, they bought from Iran, which is cheaper, but inferior to the Greek saffron. They accepted our high quality and changed their way of production. They are only choosing filaments from Krokos Kozanis that gives color and aroma to one of Italy’s oldest and most famous liqueurs,” continues Mr. Mpakagias, adding that the consumption of the Fernet Branca plant in Milan is 500 kg per year, so this collaboration enables new Krokos Kozanis’ producers to increase their production. Despite the difficulties, despite the challenges and despite the “wicked merchants” who will slowly leave the area as he says, the Greek businessman stands out for his determination and his appetite for work. After all, as he points out, he began to deal with the introduction of products in Italy “when the great crisis began in Greece and here they had the impression that we are lazy. I have one name, one mother and one homeland. So I have to show that we have good products, that we have the Formula One of Greece. Besides, my company is called Eccellenza Ellenica, ie Greek Excellence.” So, even though, for some people in Greece, excellence is considered to be a… a lost relic, Greek businessmen such as Mr. Mpakagia shine brightly in advertising abroad and contributing to the growth of the gross national product. Krokos may, therefore, be blooming in Kozani, but its beauty, its quality, its flavor, and its aroma do not know borders.